Eric Gilbert was elected to serve as chairman of the ARCC board of directors. The Adirondack Regional Chambers of Commerce (ARCC) announced that Eric Gilbert of Six Flags Great Escape was elected to serve as chairman of its board of directors for 2019. Gilbert has been a member of the board of directors since 2013 and served as chair-elect in 2018. “I am honored to be part of this exciting group of business and community leaders. The Adirondack Regional Chambers of Commerce is a key component in helping local companies succeed, grow and thrive, as well as in expanding economic opportunity for those who live and work in our region,” said Gilbert. “We are blessed to have Eric Gilbert elected as the Adirondack Regional Chambers of Commerce Chairman of the Board. Mr. Gilbert’s passion, experience and commitment to our area will help ensure that our business and non-profit community will continue to work together to make our region one of the best places to live in the world. Many thanks to Tim Jansen for his leadership as chairman over the past year,” said Michael Bittel, ARCC president and CEO. 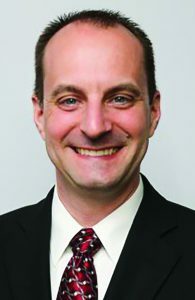 In addition to Gilbert, the following individuals were elected to serve as officers of the ARCC in 2019: Marc Monahan, Glens Falls market executive of NBT Bank, chair-elect; Brian Bearor, CEO of Family YMCA of Glens Falls, vice chairman; Bill Batkay, vice president of Miller Mechanical Services Inc., vice chairman; Leslie D’Angelico, senior vice president, director of retail banking at Adirondack Trust Co., vice chairman; Sarah Lindsell, owner of SBLindsell LLC, treasurer; Crystal Grimaldi, Owner of Ideal Dairy Farms, secretary; Jansen, owner of Wel-Dun Air & Water Systems, immmediate past chairman. Additionally, the ARCC recognized these individuals who served as Directors but whose terms have expired: Dianne Shugrue (Glens Falls Hospital), Bo Andersson (Flomatic Corp.) and Paul Wersten (Trust Co. Bank). ARCC serves more than 1,000 members, predominantly in Warren, Washington and northern Saratoga counties. It is a leading advocate for regional businesses on a wide range of public policy issues and provides its members with a wide variety of business education, development and networking programs.